Globally renowned Australian surrealist artist Andrew Baines is one of those artists who creates incredibly fun work that is inspiring on many levels – from his ability to create surreal photo shoots to his commentary on the slavery of office cubicles and corporate culture. Famous for his trademark surrealist style, Baines puts politicians, orchestras, cows, Hills Hoists, dachshunds and masses of suited volunteers in the sea for photo shoots. Prime Minister Malcolm Turnbull is just one of a handful of politicians to have participated in Baines’ human sculptures by the sea. Based in Adelaide, Baines is represented by leading commercial galleries around the world and has exhibited in Australia, Italy, USA, Canada, UK, Switzerland and Singapore. He has been included in a European encyclopaedia of surrealism, Lexikon der Surrealisten; a Portuguese book on Surrealism, International Surrealism Now; and is the only Australian artist featured in a European travelling exhibition of the same title. In 2017 he was commissioned by United Nations Association of Australia to create a photo shoot-inspired painting for official UN ‘70th year anniversary’ envelopes, as well as a two-metre-high ‘peace message in a bottle’ to be sent around the world. 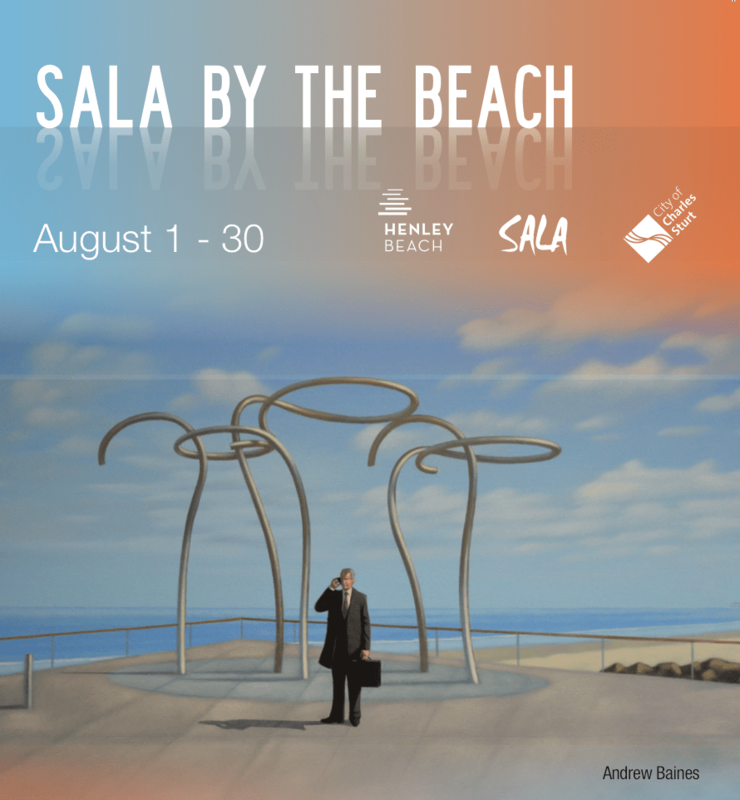 Throughout the month of SALA, for August 2018 you can visit our clinic at Henley Beach to view a collection of Andrew Baines’ pieces. For our opening times, check out our website and we look forward to popping in soon.